New Yorkers rally for Marzieh Hashemi | Fight Back! 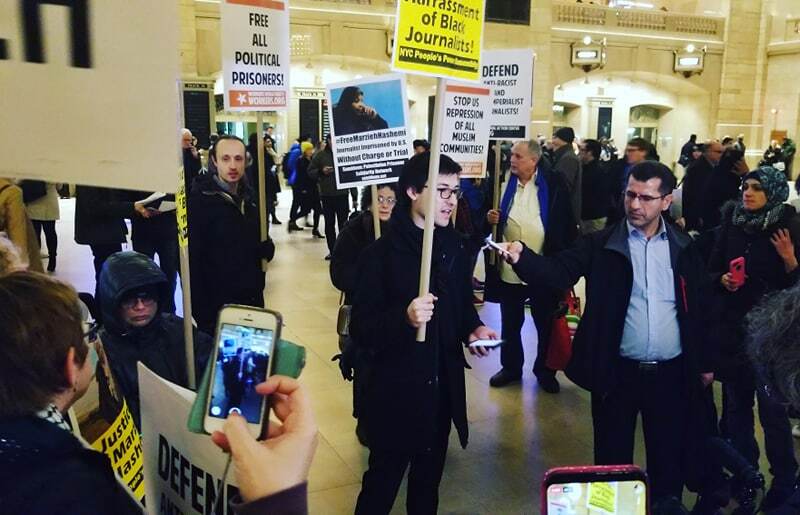 New York, NY – On January 25 several dozen activists gathered in Grand Central Station to bring attention to the case of Marzieh Hashemi. Hashemi is a Muslim, African-American journalist who was imprisoned on January 13 when she was arrested by the FBI at the Saint Louis International Airport. She was on her way to visit her sick brother in Denver. For almost two weeks she as held as a “material witness” for an undisclosed investigation. 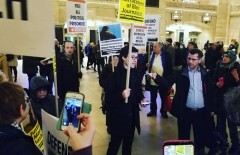 Hashemi was finally released shortly before the protest, but her family asked for the protesters who were mobilizing to continue their plans, so they could bring awareness to the U.S. government’s treatment of Hashemi. The protest was called by the International Action Center. There were several speakers, including Jake Holtzman from the Committee to Stop FBI Repression, who offered a message of solidarity. In his message, he highlighted how the U.S. government has always treated Muslim and Arab folks with bigotry and hatred, by connecting Hashemi’s case to the case of Rasmea Odeh. Most importantly, he emphasized that we must fight back against racist attacks. The protest continued with more speakers and chants, as organizers handed out informational flyers.